How Cost Effective is Stone Siding? How Does Natural Stone Compare to More Affordable Faux Stone Options? Natural stone is typically reserved for grand structures like cathedrals and university buildings, but depending on the structural stability of your home, you can also add it to your home’s exterior to create a stunning look that will last a lifetime. 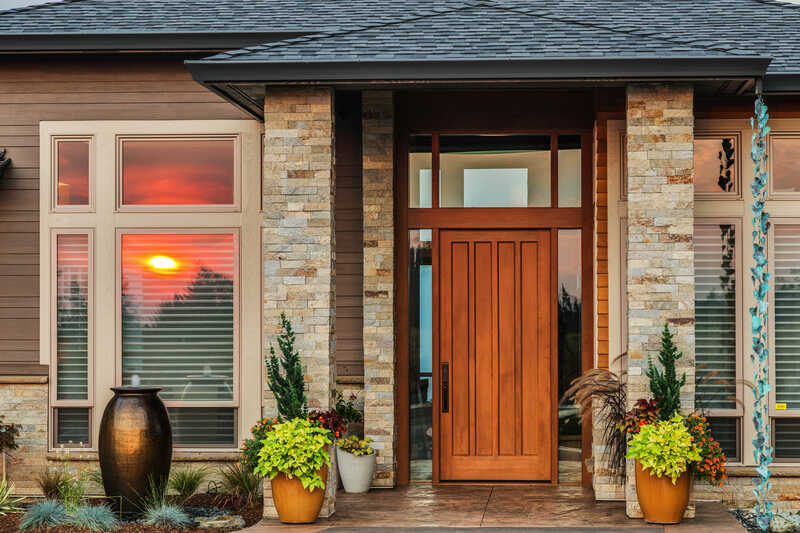 While significantly more expensive than other home siding options, natural stone is completely resistant to rot, insects, fire, and almost anything that mother nature can throw at it. In fact, depending on where you live, installing natural stone may even earn you a discount on your homeowner’s insurance premiums. So while the initial investment may be steep, the long life-span of natural stone, combined with a potential increase in your home value, natural stone is definitely worth the investment if your home’s structure and your budget can support it. Natural stone creates a unique look for your home as it’s not crafted from a mold in a factory and comes in a variety of natural colors and textures to give your home a distinct, one-of-a-kind look. Natural stone is significantly more durable than other types of siding, as it won’t fade over time and is resistant to chipping or scratching. Additionally, if making an environmentally sustainable choice for your home is important to you, natural stone is a fantastic choice as it is naturally occurring, emits no gases that would impact indoor air quality, plus with its durability and relatively low maintenance it will last the lifetime of your home. Therefore, you don’t have to worry about replacing it and sending construction waste to your local landfill. Depending on where you live you may be able to use stone that comes from your immediate area, reducing CO2 emissions from long-haul transportation costs. Before selecting natural stone for your home’s exterior, you’ll need to make sure that you budget can accommodate the high cost–typically $15-30 per installed square foot. Additionally, because of the heavy weight of the stone and need for heavy duty professional tools to cut the stone, this is definitely not a do-it-yourself project. You’ll need to consult with a professional to first make sure that your home’s structure can handle the additional weight from the stone, as well as to complete the installation. While natural stone siding is probably the most expensive siding choice you can select for your home, unlike other siding choices, you can expect it to last the lifetime of your home so it’s a one-time investment. Additionally, while the 2016 Cost vs. Value report indicates that replacing your siding can yield a 77% rate of return on your investment, you can expect an even greater return with stone. According to Real Estate Pro Magazine, stone siding is very attractive to prospective homebuyers as they associate natural stone with quality, polish, and durability. Regularly inspect your siding: A few times a year, inspect your siding to look for signs of damaged stones. Though natural stone is very rugged and durable, it can be damaged by impact or loosened by intense vibrations. If you find any cracks, apply a small amount of mortar into the crack that has formed around your stone. While wearing a latex glove, smooth the mortar with a damp finger to work it into the cracks and create a smooth, finished surface. Allow the repairs to dry overnight and inspect, reapplying if drying has opened the gap again. If cracks continue to be a problem, consult a professional. Gently clean your natural stone: To clean your natural stone siding, simply fill a bucket with warm water and add a little vinegar or dish soap to create a mild cleaning solution. Scrub the stones with a sponge or a soft bristle brush that has been moistened with your cleaning solution to remove any stubborn dirt. Finally, rinse your natural stone thoroughly with water to ensure no soapy residue remains. You can create the look of natural stone at a more affordable price by using manufactured or faux stone, but it’s important to understand the difference in quality. Faux stone is created by pouring concrete into a mold that resembles natural stone, and then that product is stained so that it more closely natural colors. Contractors started using faux stone decades ago as an alternative to heavy natural stone–typically at least four inches thick–that placed a lot of weight on the structure of a home. Faux stone is less expensive, as it forgoes the quarrying process, but also because its light weight makes for installation significantly easier. The natural stone market responded to competition from faux stone by developing new sawing processes to produce a much lighter product, most often referred to as natural stone veneer. Natural stone veneer makes natural stone more budget-friendly and lessens the impact on the structure of your home. The look of natural stone is superior and it can be customized to fit your home as masons can cut and chip stone to make it fit a desired pattern. This kind of customization is less possible with faux stone, as cutting and chipping would expose the inner, unstained concrete. Additionally, while faux stone may look great from far away, up close, it can’t compete with the stunning beauty of natural stone. Natural stone has a unique appearance and texture, while faux stone is limited to a certain number of molds. Finally, in terms of longevity natural stone provides a beautiful look for the lifetime of your home, while faux stone is stained and painted–so count on fading, less durability, and more maintenance.